An easy introduction to roulette game: roulette general rules description, how to cope with roulette table layout, making bets and other procedures. Roulette is one of the most popular casino games and is usually considered as a game of pure luck. 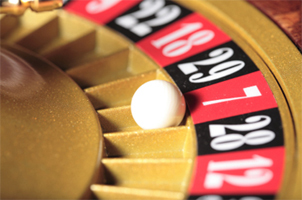 Actually, there is a great deal of truth in this statement but it is worth to keep in mind that roulette rules imply that there are also players who choose a kind of the game they would play, make roulette bets and, what could sound a little bit strange but comprises a crucial moment in roulette game, - they decide the moment when to stop gambling. The object of roulette is to guess correctly the winning number (their combination) or its certain feature, such as colour, odd/even and high/low characteristics. There are 36 numbers depicted on a roulette wheel as well as on roulette table layout. Additionally, there could be one or two slots for zero positions. Their quantity depends on a kind of roulette variations: in European or French roulette there is one single zero pocket while in American game there is also double zero slot besides a single one. All the numbers are coloured red and black in turns with an exception of zero positions which are green-coloured. Roulette table layout is a place where players could locate their chips according to the bets they are making. It presents 36 numbers that are divided into 3 columns and 12 rows with one or two zero positions on the top of layout. If gamblers are betting inside they should put chips on the numbered area and in case of outside betting there are special rectangular segments on the long side of layout, which represent places for even/odd, high/low betting and bets on colour as well. Players do not usually use regular chips for making bets on roulette table. In order to stake they need to put some money on the layout and ask a dealer to exchange them for specific roulette chips which are individually coloured, so neither gamblers nor dealer could mix them up. This rule is obeyed rather strictly and you should not think that casinos cavil at every trifle when a croupier would ask your husband or wife to play with chips of different colour than yours. There are usually 6 or 8 players round the table which could either sit or stay near. The seats are provided only for the gamblers and non-players would be asked to leave if they sit down. Each round of the game begins when a croupier clears off loosing bets from previous session and pay winnings to luckier players. It is exactly the moment when you might make a bet by locating the chips on appropriate positions. Further, a dealer spins a wheel and the ball in the opposite directions. Eventually, the ball lands in the one of the pockets on roulette wheel defining the winning number. A dealer announces an outcome and, again, clears off loosing chips and pays the winners. That is all - the circle closed up and it all came back to where it had started - to making bets.